I’ve been working like crazy on comprehensive exams this week, and thought I would share some of the latest dialogue on Gamification I’ve researched and written. I think it’s a highly relevant topic to a lot of contemporary research that has any public leaning–like our reconstruction of Decatur St project we’re still investigating and researching. Enjoy! The terms white hat and black hat originate from the hacker community. White hat hacking refers to those who break cyber security barriers for non-malicious reasons; testing internal security for vulnerabilities(Knight 2009)(Douglas 2010: 503), and sometimes extended into civil activism like leaking documents into the press. Black hat hacking refers to the violation of computer security systems for maliciousness or personal gain (Moore 2005: 258). The dichotomy is in the intention behind one’s action. 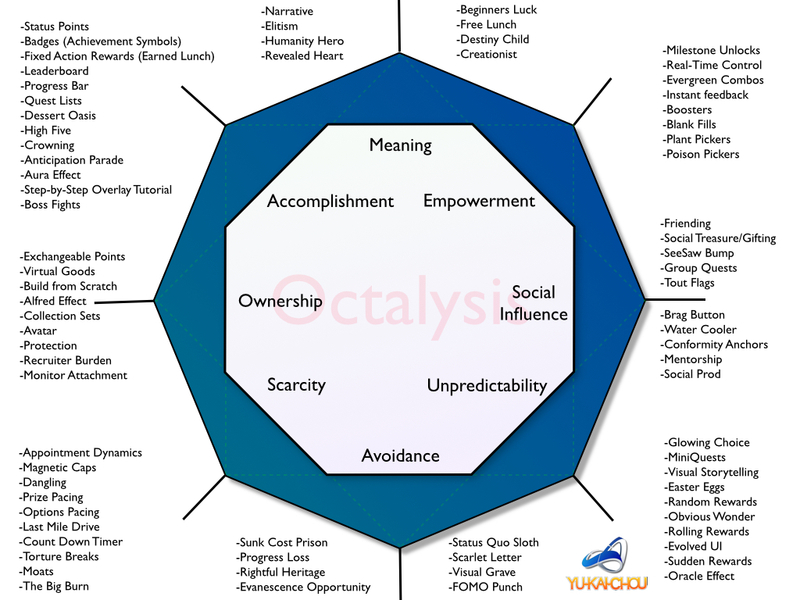 The terms were applied by Yu-Kai Chou (2014) in his theories of gamification to mirror the intention behind its application. White hat elements of design promote engagement by letting the user express creativity, feel success through mastering the gamified application, and promote a higher sense of meaning—it fosters positive emotions. Black hat elements are those that demand user action from unpredictability of rules, fear of loss, or from the need for things given arbitrary value. The motivations to engage are still evident with black hat elements, but the end user experience elicits negative emotions. Although Chou draws this distinction of good and bad motivating game design elements—black hat motivators are not inherently malicious—they are simply different sets of motivators. Black hat motivators play off negative emotions to force engagement and can be used in applications like phone apps that make the user feel anxiety over personal health—like applications that would help with smoking cessation, or improve diet through reminders of fear or things the user cannot have unless rules are followed done within an irregular time-frame. Chou argues for a balance between both white hat and black hate game design for a healthy and sustainable game or application of gamification. Black hat techniques might drive an initially large user-base, but sustained negative emotions will eventually drive users away once they are able to, because they will become exhausted at the feeling of having no control over their selves. White hat elements help sustain user interaction by relinquishing them control over their actions once initially engaged with the application. These two differences of intention behind gamification’s goal of behavioral outcome change provide the framework necessary to look at case-examples of web-based gamified applications and how they have transformed the design behind them. Tolmie et al (2014) recently published two parallel gamification focus studies that reflect these concepts of black hat versus white hat intentions. Their goal was to test the feasibility of encouraging engagement across a broad spectrum of potentially interested parties and stakeholders in the realm of e-government or e-democracy—online platforms of civic engagement. They recognized that information and communication technology is increasingly the platform where information about political issues and its debate are disseminated, fostering wider democratic participation and greater transparency and accountability in government policy and processes—a benefit to democracy and society (Tolmie et al 2014: 1763). They add an important caveat to this idea; the importance in considering how well the systems of online communication function to promote the more vital component of civic engagement—debate (Tolmie et al 2014: 1763). They explain this issue in how newer techniques are necessary to harness this newer technology. The reality is that people have moved away from consuming media through a single point of contact, i.e., news reports created centrally that are then sent homogeneously to an entire population at specified times. It has moved towards distributing information to individuals using some form of a personal computer to consume information simultaneously and heterogeneously—or from varying sources (Tolmie et al 2014:1764). Debate has moved from sitting around the television and discussing with small groups to discussing in large-scale public forums, like social media. They looked at two different gamified applications to look at user engagement with different sets of elements. Bicker Manor was an interactive game centered around scheduled debate between a hypothetical family that users interacted with both through a web interface and through SMS messages to their phones. It expressly sought to discover ways in which web-technology could be used to promote mass-participation in an event (Tolmie et al 2014: 1764). Their second case-example was a gamified application called Day of the Figurines—played by strictly sending and receiving messages on a mobile phone that interacted with an ongoing twenty-four hour a day small virtual town (Tolmie et al 2014:1765). The aim was to discern the difference of debate and interaction between the two games through the game design elements used in their production. Day of the Figurines was designed to interrupt users’ routines—their daily lives, whereas Bicker Manor allowed users to easily manage their interaction with the game so it would not hinder their routines. Day of the Figurines used black hat elements of negative emotions and stress through temporally unpredictable messages that required responses to succeed, forcing the users to manage their interactions with the game as they came about—often leading to more interactions with others not playing the game who demanded explanations for the interruptions. Bicker Manor took a white hat approach where the rules were ordered and predictable, allowing people to integrate the game into existing routines of their choosing that did not disrupt their daily routines and demand explanation from others not playing the game (Tolmie et al 2014:1768). The core black hat strategy used by Day of the Figurines is its structure and engagement mechanisms of unpredictability and sense of loss that enabled users to reason out adequate rationale to prioritize the games interactions over the daily required routines of their personal lives. This was successfully achieved through competition and that user would suffer negative consequences if a response was delayed by a short length of time (Tolmie et al 2014:1769). Bicker Manor was not designed to illicit those motivations—it was designed to replace the same daily routines through intrinsic motivation of the users own perceived value of interacting with the game—it was largely unsuccessful in comparison to Day of the Figurines, especially with regards to engagement with not only the game but with the real world around them. These studies show that power of black hat game design over white hat game design. Although players complained that the content in both games was not motivating or memorable—they still engaged with the black hat designed game more (Tolmie et al 2014:1770). This being said, there are limits to the levels of disruption a gamified project should implement. Some unpredictability is good in that it forces interaction and engagement, but this is still an indirect form of engagement. How can engagement be intrinsic and direct? A balance between black hat and white hat design elements seems to be the answer. Chou (2014) offers several examples of recent gamified services, some games that he has mapped between black and white hat game design element usage and the issues associated with a game being out of balance. Zynga games, the company behind Farmville, a popular Facebook game where one plays a farmer, largely works with black hat techniques where a user’s motivation is stemmed from the anxiety of real social pressure and perceived personal pressure to maintain one’s farm and acquire in-game currency only achieved through unpredictable or highly specific times of required interaction. The cost of not interacting is a sense of being left behind, and seeing one’s farm deteriorate. The engagement follows the same patterns of Day of the Figurines but takes it a step further in not only interrupting the users’ daily routines but also interrupting the routines of their social circle by offering incentives to directly solicit it through social media in a pyramid scheme of in-game currency accumulation. To echo Chou’s point about the temporal instability of games focusing entirely on black hat game design elements: Farmville and its developer, Zynga, has been in steady, rapid decline since Farmville’s release in 2009. As of 2013, the decline was obvious after numerous employee cuts and their public share value dropping 70 percent (Bachman & Brustein 2013). Games and applications that have utilized a better balance between black and white hat design elements, Chou (2014) argues have had longer success cycles, including: Facebook, Twitter, World of Warcraft, and Candy Crush. What do these Case Studies Teach Us? When utilizing game design elements to further behavioral outcomes, it is important to understand the mechanisms of these elements and whether or not they promote positive and healthy emotional engagement. In context with the Phoenix Project’s goal to apply gamification to the online database of archaeological and historical material with the end goal of achieving civic engagement—it is not only an ethical requirement to responsibly use a balance of white and black design elements to promote engagement and not addiction—it is also a requirement to use a balance to achieve a long-term sustainable community of users. Engagement cannot be civic engagement without sustainability and a framework that allows the users to exercise their own agency. Black hat elements that promote accountability and interaction through social pressure are integral, but should never override a user’s agency—it should task the user to implement it and provide the white hat elements of ownership, accomplishment, meaning, and empowerment for their agency to engage with. Let’s talk soon about putting together a gamification workshop.